The crying of a newborn babe echoed through the bedchamber where Queen Jane had finally given birth to the new Prince of Wales, Edward Tudor. King Henry VIII and his daughters Mary and Elizabeth’s lives would change forever because of that crying baby boy – and it would shorten the Queen’s. The Monday following the birth of Prince Edward a grand display of succession was displayed when a glamorous christening ceremony was held for the new heir to the English throne. 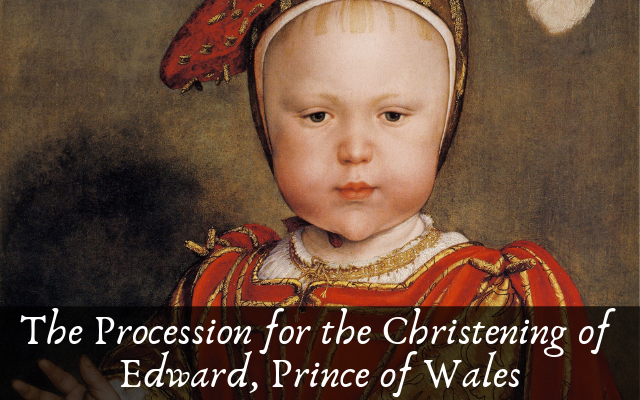 While the actual procession took place in October 1537, the images shared belong of his christening procession were not made until 1560. 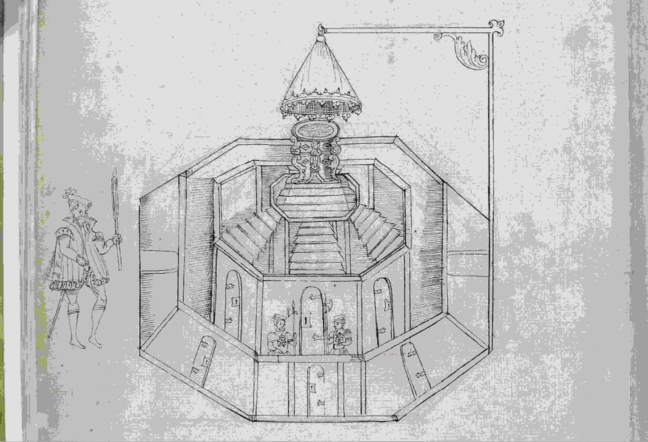 The platform, or font, was tall enough so that all who came to witness the christening could visibly see it happening. It was like a stage in that sense. 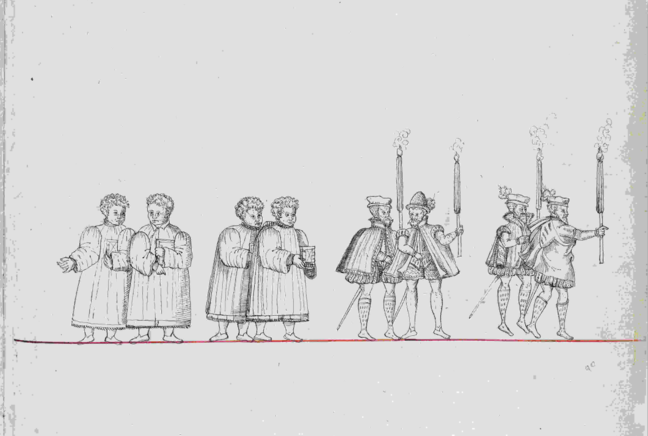 “The procession was led by 80 knights, gentlemen ushers and squires, walking two by two and carrying candles. Behind them came the staff of the Chapel Royal, the choir, the dean and the chaplains.”¹ It is stated that there were at least a dozen choir boys instead of the four shown above. 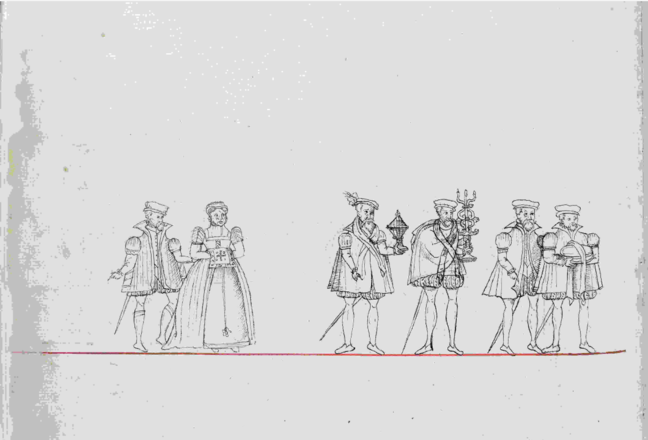 As the procession continued, the members walking in the procession only became more and more important. 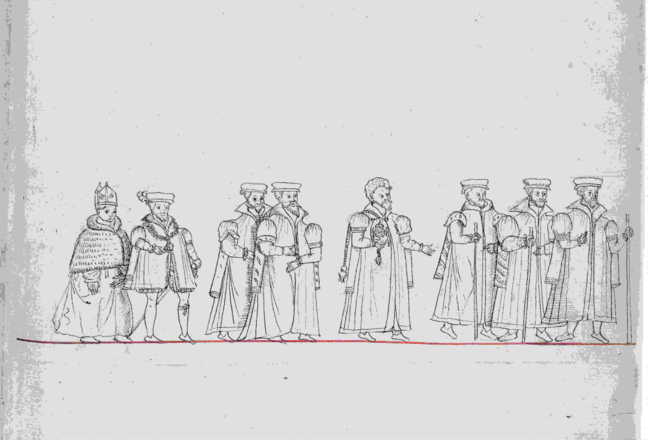 In this image we see the Council of the King and some foreign ambassadors. 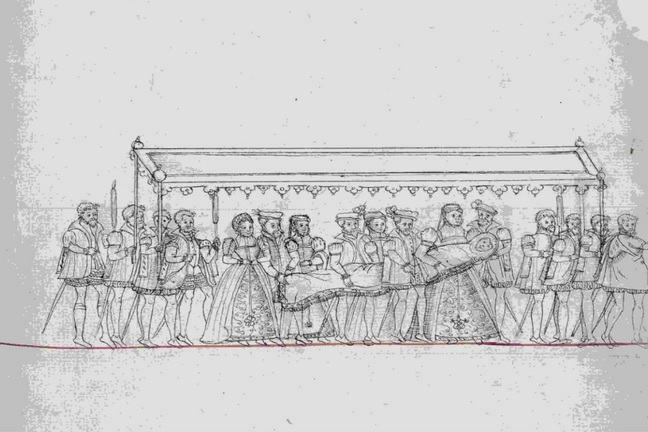 Lastly in the procession is the King’s daughter the Lady Mary, followed by her ladies. When the Prince was christened all the torches were lighted and Garter King at Arms proclaimed his name. “This done, this service following was in time the Prince was making ready in his traverse, and Te Deum sung”:—First, to the lady Mary the lord William to give the towel and the lord Fytzwater to bear covered basins, and the lord Montagew to uncover. Item, to the bishop that doth administer, the lord Butler to bear the towel, the lord Bray to bear the basins and the lord Delaware to uncover. To the duke of Norfolk and abp. of Canterbury, godfathers, the lord Sturton to bear the towel and the lord Went worth to give the water. To serve the ladies Mary and Elizabeth with spices, wafers, and wine: the lord Hastings to bear the cup to lady Mary, and the lord Delaware that to lady Elizabeth; lord Dacres of the South to bear the spice plates to both, lord Cobham the wafers, and lord Montagew to uncover the spice plate. The bishop that doth administer, the duke of Norfolk and abp. of Canterbury, godfathers at the font, and the duke of Suffolk, godfather at the confirmation, to be likewise served by knights appointed by the lord Chamberlain. All other estates and gentles within the church were served with spice and ypocras, and all other had bread and sweet wine. The going homeward was like the coming outward, saving that the taper, salt and basin were left and the gifts of the gossips carried, i.e. Lady Mary, a cup of gold borne by the earl of Essex; the archbishop, 3 great bowls and 2 great pots, silver and gilt, borne by the earl of Wiltshire; Norfolk, ditto, borne by the earl of Sussex; Suffolk, 2 great flagons and 2 great pots, silver and gilt, borne by Viscount Beauchamp. 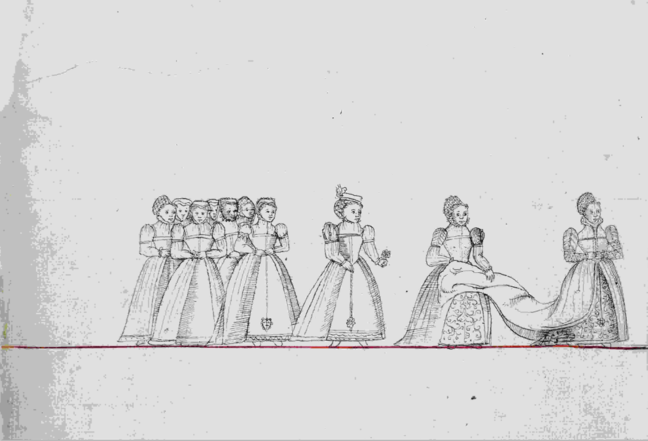 Lady Elizabeth went with her sister Lady Mary and Lady Herbert of Troy to bear the train. Sounding of the trumpets. Taking of “assayes.” The Prince was then borne to the King and Queen and had the blessing of God, Our Lady, and St. George, and his father and mother; and the same day the King gave great largess. Take a look at the list and note all the well known Tudor names who attended. This was a huge event and anyone who was anyone would wish to attend the coronation of the heir to the throne. The lord Chancellor. Dukes of Norfolk and Suffolk. Marquis of Exeter. Lord Cromwell, lord Privy Seal. (fn. n15) Earls of Arundel, Oxford, Essex, Wiltshire, and Sussex. Viscount Beauchamp. Lords Howard, Admiral, Delaware, Sandes, Bray, Montagewe,‡ Sturton; Hongerforth of Hechbury, (fn. n15)Cobham, Dacre of the South, Montjoye, Fitzwater, Hastings and Butler. The abp. of Canterbury. 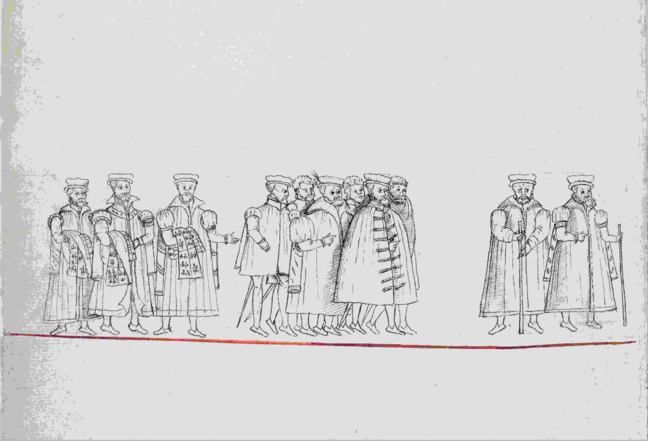 Bishops of London, Lincoln, Rochester, Chichester, St. Asse, and Carlisle. [Abbots of Westminster, St. Albans, Waltham, Towerhill and Stratford]. (fn. n16) Mr. Henage, Sir John Russell, Sir Francis Bryan, Sir Nich. Carowe, Sir Thomas Cheyny, Sir Ant. Browne, Sir John Walloppe, Ric. Long, Thos. Semere, Hen. Knyvet, Peter Meutus, Sir Humph. Foster, Geo. Harper, John Welsborne, Rog. Ratclif, Ant. Knyvet, Rob. Turwytte, Sir Humph. Ratclif, Sir John Sentjohn, Sir Thos. Rotheram, John Williams, Ralph Verney, Sir Wm. Essex, Sir Ant. Hongerford, Sir Wm. Barnden (in another hand “ou Baratyn”), Sir Walt. Stoner, Sir John Brown, Sir John Bouchier, Sir Edw. Baynton, [Sir Henry Bayngton], (fn. n17) Sir Hen. Long, Sir Wm. Kingiston, Sir John Briggis, Sir Nich. Poyntes, Sir Walt. Deynis, Ant. Kyngston, Sir John Sentlowe, Sir Hugh Paullet, Sir Giles Strangwishe, Sir Thos. Arundell, Sir John Horsey, Sir John Rogers, Sir Wm. Paullet, John Paullet, Sir John Gage, Sir Wm. Goryn, Sir Edw. Nevill, Sir John Dudley, Sir Willm. Haulte, Sir Edw. Hutton, Sir Wm. Kempe, Sir Thos. Poynynges, John Norton, Sir Ric. Weston, Sir Ric. Page, Sir Giles Capell, Sir John Rainsforth, Sir Thos. Darcy, Sir John Sentleger, Sir John Turrell, Wm. Sailiard, Sir Chr. Willoughby, Sir Ric. Sandes, Sir Geo. Somerset, Sir Arth. Hopton, Sir Ant. Wingfeld, Sir Wm. Drury, Edw. Chamberlain, Ric. Sowthwill, Sir Hen. Parker, Sir Griffith Dunne, Sir Ph. Butler, Sir Rob. Payton, Sir Giles Alington, Thos. Meggis, Thos. Wriothesley, Ric. Manners. The dean of St. Stephen’s, archd. of Richmond, dean of Exeter, dean of Windsor, dean of Sarum, Dr. Bell, Thurlbee, Dr. Turryt, Mr. Patte, Dr. Wilson, Dr. Skippe, and Dr. Daye.